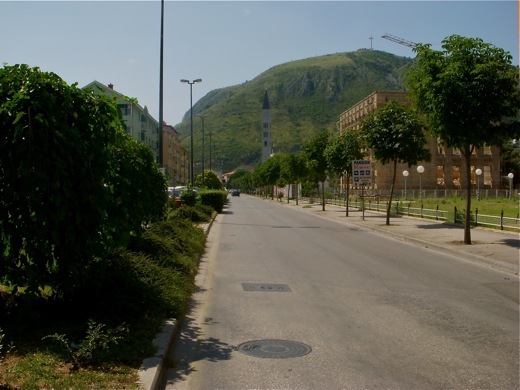 The Former Front Line of Mostar, Bosnia. Mostar is a the largest town in the Herzegovina region, formerly one of the most ethnically diverse cities in the country that formed a bloody front line, and suffers a geographical division of ethnic groups. 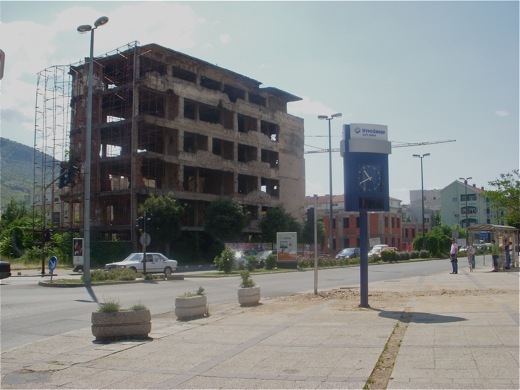 The city was the most heavily bombed of any Bosnian city during the war following the break up of then-Yugoslavia. Yet, any old ethnic tensions are unnoticeable while strolling around the streets, visiting with the locals, and people watching from the cafes. 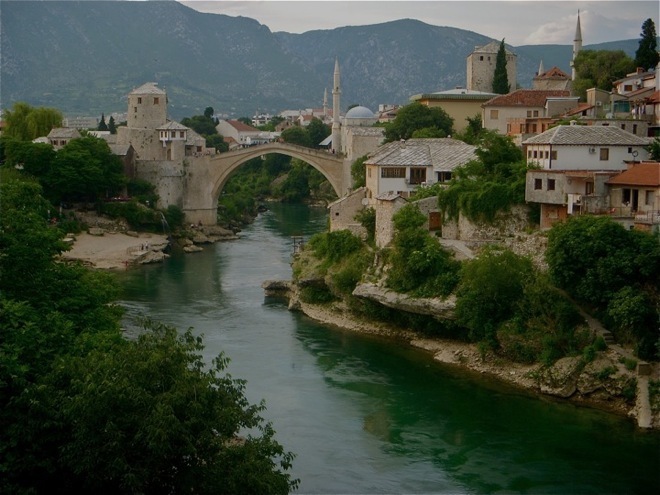 The old town and its eye-drawing bridge that the Turks build in 1566, and rebuilt in 2004 is dramatically situated above the Neretva River. The contrast between the familiar features of mass tourism and the highly visible war damage gives the town an interesting atmosphere. The old town is packed with bazaar nicknacks, over priced cafes, and restaurants that line the old cobble stone walkway. If you eat in the old town you will be paying double due to the fact that they charge in Euros, a salad will cost 2 euros which is 4 Bosnian Marks, the local price is 1.5 marks. Many adventurous divers will jump from the old bridge into the icy cold Neretva river. During July of each year they have diving competitions from the old bridge. The front-line during the war was the four-lane divided road across the river. On this street still stands bombed buildings and several other damaged war relics. The Front Line of Mostar—1993. The former front line street points to the single tall Catholic Cathedral obelisk style cross tower. This Phallic symbol spans over all other buildings in Mostar. 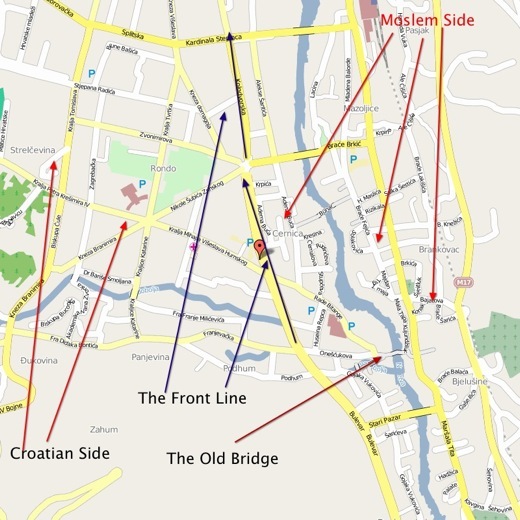 The Croatians use the high hill to bomb the city and successfully blew-up the Old Bridge in 1993. It is strange how Western Christians cannot see through this deception of Idolatry and the bloodguilty behavior of Christendom. Within the town of Mostar many Moslem Minarets which parallels the same symbolism. The symbolism of the cross denote War, one path crossing the other, the Knights Templars cross was red that symbolizes blood. Great article! It’s nice to get a professional history lesson from a travel blog for once. I really enjoyed the pictures also, croatia is a beautiful country and I hope to travel there someday. I love that first shot of the city. Great history lesson and loving the new site! Next post: Homestay in Mostar, Bosnia and Home Cooking! Previous post: From Sarajevo to Mostar—Bosnia.